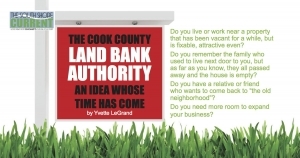 THE COOK COUNTY LAND BANK AUTHORITY (CCLBA) was created in 2013 to address the large inventory of vacant residential, industrial and commercial property in Cook County. Its goal is to return vacant land and abandoned buildings to productive use while preserving and revitalizing neighborhoods. The Land Bank Authority can acquire, hold and transfer interest in real property throughout Cook County in order to promote redevelopment and reuse of the vacant, abandoned, and foreclosed properties too often prevalent in our community. “We want to save vacant properties and reduce their potentially blighting influence on neighborhoods” said Rob Rose, Executive Director of The Cook County Land Bank Authority. The Land Bank Authority supports efforts to stabilize neighborhoods and stimulate new development in line with the goals and priorities of community stakeholders and government partners. It can wipe out the liens and encumbrances that can make redevelopment and reuse of festering buildings here-to-fore impossible by neighbors and other local stakeholders. This unique community redevelopment and investment tool was created to specifically address the real property issues that are so difficult for locally focused residents to overcome. The CCLBA can acquire and convey previously tax-delinquent and/or municipally encumbered properties and efficiently transfer them to responsible new owners. It can sometimes even overcome the community challenges inherent in so called “heir property’; where a home or other small residential building that was previously occupied by a caring owner sits deteriorating for years. Neighbors suffer as relatives have waged a family battle over who should or who can afford to carry the property that has been the family asset into the future. The CCLBA can also strategically accept property donations. To prevent further negative community impact, successful transferees must have sufficient capacity to acquire and redevelop the property awarded to them. Properties must be professionally redeveloped within 12 months of conveyance in accordance with code and the CCLBA places a removable lien on the property to prevent “flipping.” But the lien would be released prior to sale of a new homeowner moving into a newly rehabbed home. Currently, there are 21 properties in and around South Shore that are being redeveloped by new owners through the Land Bank. 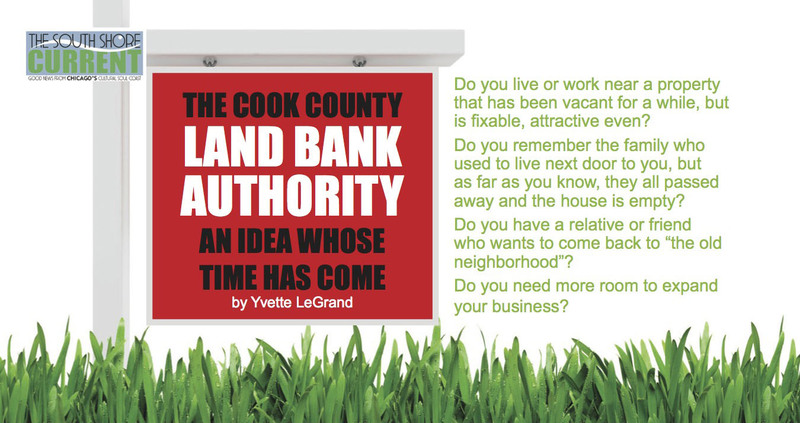 If this way of moving the community forward is of interest to you and/or your organization, visit www.cookcountylandbank.org or call 312/603-8015 to learn about how this program can help you create a stronger community and a better life.